LATE BREAKING NEWS: Drum Circles Cure Common Cold! 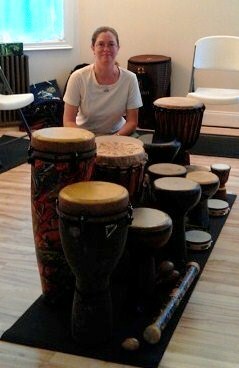 These are some of the drums I bring to my monthly drum circle. But like any miraculous headline, there’s a catch. In my case, the effect lasted only so long as I was actually drumming. Once the drum circle ended and I was packing up the drums to go home, all of the symptoms of my heavy head cold returned. But while we were playing last night, it was a surprising miracle. It was such a noticeable difference that the other members of the group remarked on the change in me. But I shouldn’t have been so surprised. Research supports the idea that drumming truly is a healing art. Mostly I drum for the sheer joy it brings me. Rhythm touches something deep inside of me, and affects me in ways not usually so dramatically noticeable. Drumming relieves tension, stress, anxiety, fear, anger – the entire range of emotional states that leaves people tied in knots. For me, at least, it’s impossible to hold onto these states while drumming. I may start drumming from that place, but the rhythm lifts me out of that emotional state and transports me to a stronger, calmer, more genuine state of relaxation. Relaxation doesn’t always mean calm – I’m usually energized by the practice, but it relaxes and unwinds all of the emotions that have me wound up. And when you clear that away, what is left is a natural feeling of well-being and joy. Necessary Context: I’m something of a science geek. I enjoy reading the latest research findings from a diverse range of fields of study. I like looking for connections between these domains, in search of my own unified theory of the universe. A lofty ambition perhaps, but really, aren’t we all in search of greater understanding and unity of meaning? So I subscribe to science newsletters, and try to give attention to the front lines of research. I’m no expert, but I try to stay informed. Scientists have been studying the healing effects of drumming from a number of different angles. One of the most interesting to me are the effects that drumming has on the brain. As you may be aware, the activity of our brains can be measured in brain waves with devices such as an EEG (Electroencephalography). Electrodes are attached to the scalp which measure the electrical activity of the neurons firing in the brain. Through EEG studies, we learn that there are different brain wave patterns associated with different states of consciousness, both awake and sleeping, and the stages in between. When we are awake and focusing our attention, our brains produce beta waves. By immersing ourselves in highly structured rhythmic environments such as drum circles, our brain waves begin to align with the rhythms in a process known as entrainment, which alters brain waves in measurable ways. Alpha waves bring us to a state of deep relaxation, where creativity is unleashed. This state can be achieved in the brains of drummers fairly easily and quickly. It produces feelings of euphoria and well-being. As the drumming persists, the brain can shift gears again, and produce theta waves. Theta waves are associated with a deep meditative trance state where a doorway to the dreaming mind is opened. Insight and inspiration are often found in this state of mind. Drumming is a key that opens the door to these states of consciousness. The effects of drumming extend beyond their influence on brain waves. In addition to producing a measurable relaxation effect, drumming also releases endorphins, neurotransmitters that act as natural opiates which relieve pain and produce natural feelings of euphoria. Recent promising research also shows that drumming boosts the immune system, helping the body produce more killer cells that work to combat everything from viruses to serious illnesses such as cancer. Cortisol, the stress hormone suspected as the root cause of many diseases, also decreases measurably while drumming. Our entire biological response seems to get a tune-up when we immerse ourselves in highly rhythmic environments. So perhaps it’s not surprising that I should feel so fantastic while I was drumming last night. I went to the drum circle feeling generally miserable, chained to my box of tissues, and desiring little more than to crawl into bed. But drumming lifted me out of that entirely, creating a state of energy, joy, and euphoria that lasted even after the drumming stopped and my nose resumed it’s dripping. It’s no wonder why I’m such an enthusiastic ambassador for the drum. Next time, come join me. A seeker of truth, a dreamer of dreams, in search of meaning and bliss. Interesting! Never heard of this kind of therapy. Thanks for sharing. Thanks! I encourage you to give it a try. Most drum circles welcome beginners – no experience is necessary, and it’s easy to jump in and have fun right from the start. To find a drum circle near you, I suggest: http://www.drumcircles.net/circlelist.html Good luck, and have fun! A seeker of truth, a dreamer of dreams, in search of meaning and bliss, Kate seeks opportunities for enlightenment and expanded awareness wherever they may be found.